Why do people see the Hand of God in Great Calamities? Lisbon’s great cathedrals - Basilica de Santa Maria, Sao Vincent de Fora, Sao Paulo, Santa Catarina and Misericordia – all collapsed on worshippers. Fire destroyed what remained of its magnificent museums and libraries, with their priceless archives, tapestries and books. An estimated 15,000 were killed instantly, with a similar number of fatal injuries. Lisbon’s total death toll was about 90,000, forty per cent of its population. Another 10,000 were killed in Morocco and Algeria. Why had God chosen so Catholic a city, so holy a festival and a time when most of the faithful were at church? Why did he spare the houses - and lives - of enemies of the Jesuits? If the earthquake was punishment for vices that reputedly flourished in the city, why were its effects felt in Morocco and as far west as the Azores? When news of the event reached England two weeks later, the nation was so convinced it was a sign of God’s anger against sinful humankind George II proclaimed 6th February, 1756, a fast day. There were many acts of contrition and repentance throughout Europe. 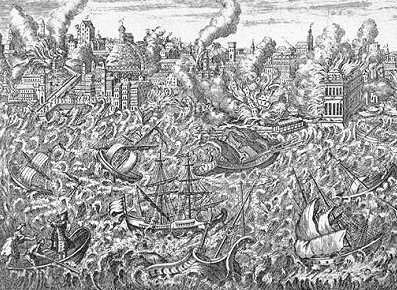 Belief in the sin-earthquake nexus has persisted, despite the scientific revolution. Fast forward two and a half centuries to another time, place and faith – early twenty-first century Iran. The worst earthquake in the country’s history (magnitude 6.6) destroyed the southern city of Bam in Kerman province, south-eastern Iran, at 5.26am local time on Friday, 26th December, 2003. It killed 26,271 people, a quarter of the population, and injured an additional 30,000. According to seismologists, this tragic event – and many others - was caused by tectonic stresses generated by the colliding Arabian and Eurasian continental plates. Senior cleric, Ayatollah Kazem Sedighi, however, suggested something else to worshippers in Tehran on 17th April this year. Today, fear of human-induced global warming has displaced fear of earthquakes. Many of the faithful seek opportunities for redemption in this new threat, despite an apparent increase of only 0.6 degrees Centigrade (+/- 0.20 degrees Centigrade) in the Earth’s average temperature during last century. They are now in “dangerous” climate change with their God. If a religion is a set of beliefs and rituals by which we order our lives, generally under the gaze of a higher power, then environmentalism is a secular religion. It preaches the sanctity of air, water, earth and so on. It promotes concern about changes in the natural world, especially those caused by our presence. It has priests and prophets devoted to ‘protecting the planet’ in the name of Gaia, as well as its rituals and sacred ceremonies. No wonder, then, there seems little difference psychologically between the rationale for Earth Day and George II’s Fast Day of 6th February, 1756; or that the faithful today continue to believe God is revealing His purpose. For them, He is encouraging humankind to repent and embrace the Gospel of Global Warming before it is too late. Where would a just God be if not in earthquakes and climate change? Where, indeed?